And the lucky trophy holders lately are: world No.5 David Ferrer, claiming his 13th career title with a 4-6 6-3 6-2 victory over Nicolas Almagro in the Buenos Aires Open final & Juan Martin Del Potro, claiming his 10th career title after beating Michael Llodra 6-4 6-4 in the final of the Marseille Open on Sunday. And Agnieszka Radwanska who broke into the world's Top5 for the first time after beating Julia Goerges 7-5 6-4 in the final of the Dubai Championships on Saturday. Top seed Ferrer, runner-up to compatriot Juan Carlos Ferrero in 2010, recovered from dropping his only set of the tournament to improve his head-to-head record against world number 11 Almagro to 9-0. "I'm really happy, this was an account I had pending. This title is something very important to me," Ferrer said in a courtside interview. "I'll be back, for sure," Ferrer told fans at the claycourt tournament at the Buenos Aires Lawn tennis Club, confirming he would return to defend the title next year. "With Nico they are always very physical matches. With the passing of the years one doesn't have that anxiety of youth," he said. Del Potro, the 2009 U.S. Open champion whose career has been hampered by injuries, broke once in each set and never faced a break point to seal victory in 82 minutes. "Michael is one of the worst opponents to face indoors because he serves very well," Del Potro, the world number 10, told a news conference. "I talked about this with my coach, it may be my most important victory since I came back from injury given the opposition I faced here," he added, referring to a wrist injury that kept him out of action for almost a year between 2010-11. 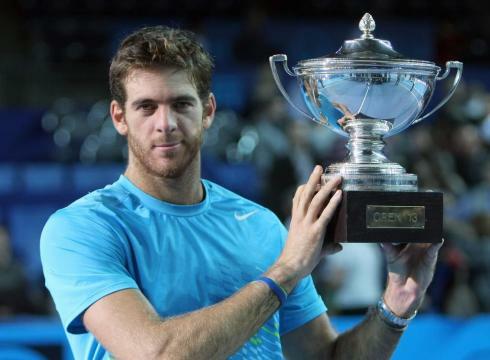 It was Del Potro's first indoor title in his fourth final attempt. "It shows how I have improved," he said. The 22-year-old Pole will move up to fifth in the world rankings after claiming her eighth WTA singles title. Trailing 5-4 in the first set, Radwanska won seven of the next eight games to go a set and 4-1 up in the second, ultimately sealing a comfortable win. "In the important moments I think I was just more consistent," Radwanska said. "Her forehand it's a very big weapon. You never know what to expect - it's going so fast, and sometimes I couldn't even move to the right way and the ball was already behind me. I just stayed calm until the end."